TEXT - Text your gift amount to 816-558-3459. 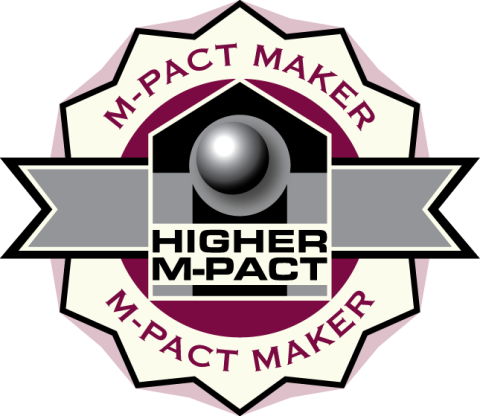 Become an M-Pact Maker and change the game for high-risk youth in our city. Higher M-Pact’s successful outcomes are due to the intense mentoring and supervision (nearly 24/7), which requires programming year-round. Thanks to our M-Pact Makers, we are able to do this easier and with more predictability knowing we have your support each month. $25/month can provide hair care, a bus pass, school supplies, meals. $50/month can provide shoes, college application fees, sports fees, equipment. $100/month can provide group activities and events or community service, gym rental. Sponsor a Higher M-Pact program or event that works with high-risk urban youth and their communities. Here are a few ways you can make a direct impact on the life of a high-risk urban youth. The average high-risk urban youth knows more people in prison than in college. This combined with their environment of poverty and underemployment, it is easy to see how difficult it is to make opportunities seem real enough for them to reach. Higher M-Pact partners with the Alpha Phi Alpha Spring College Tour to bring the opportunity to attend college into a little more focus and more realistic for our youth. During the eight day tour, youth spend their spring break learning the importance of education. Through this program we provide Easter Baskets to youth who might not otherwise receive them and Spread the Good News to families that JESUS is the reason for the season! Each and every basket will have a Gospel Tract attached with the message of Hope and Good News! Kids Across America (KAA) is a Christian sports camp. As a sister camp to Kanunak, KAA staff and counselors are dedicated to ministering to the specific needs and challenges of urban youth. Each summer, Higher M-Pact youth travel to Branson, MO to spend a week of FUN and FAITH. Through daily Bible studies, discipleship and an atmosphere of love, youth experience a week they will never forget. The thought of going back to school should be fun and exciting time but for families served by Higher M-Pact, it can be stress and expensive. For families with multiple children, the cost of returning to school can all up quickly as one hundred percent of them live below the federal poverty level and many are on fixed incomes. For these families who are barely making ends meet with the basics, the bills for school supplies and clothing can quickly become an added stress. To combat this problem, Higher M-Pact sponsors a Back to School Rally to provide a new uniform, shoes, backpack and supplies.